Heat butter over low heat until melted. Blend in flour (with flour sifter Optional). 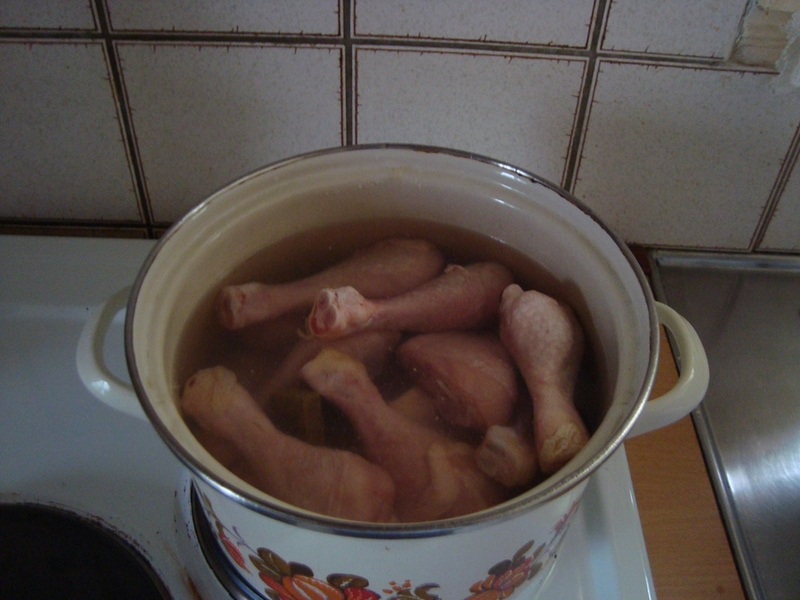 Cook over low heat, stirring constantly, until mixture is smooth and bubbly; remove from heat. 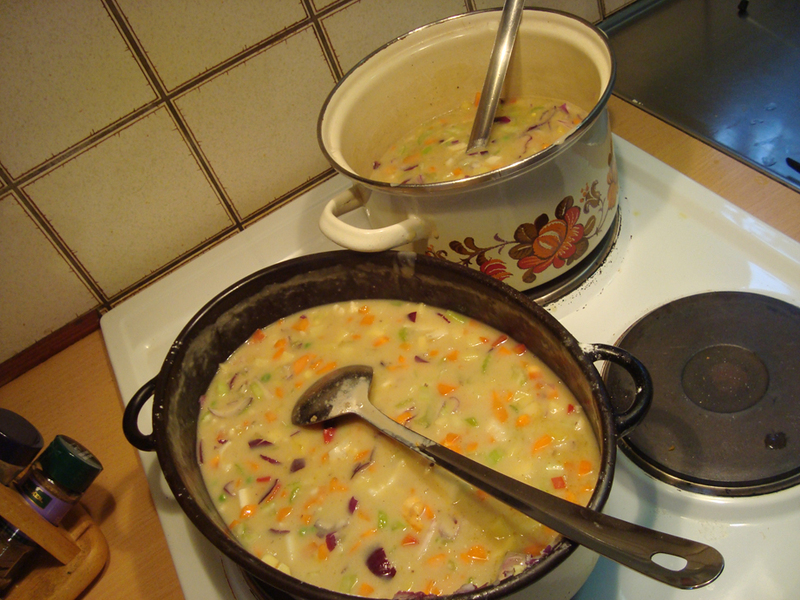 Stir in broth and milk. 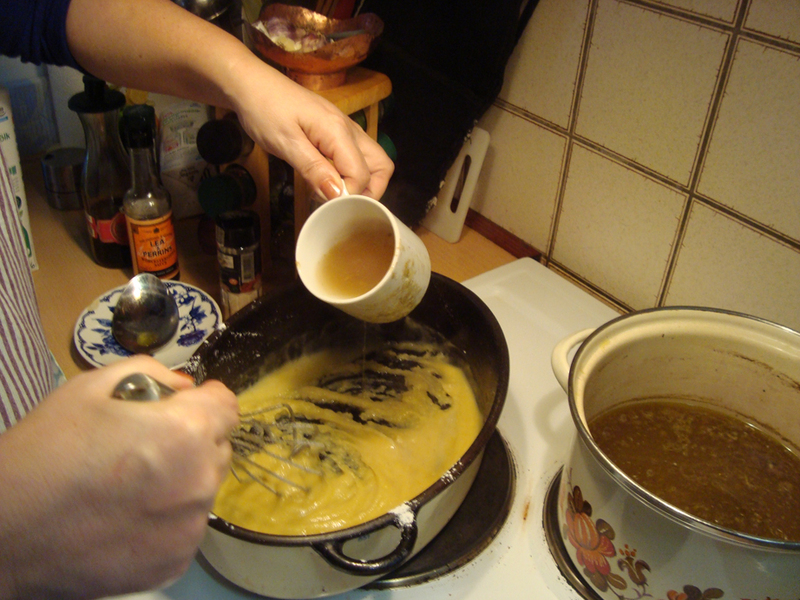 Blend in salt,pepper, garlic powder,soy sauce and Lea & Perrins sauce into your gravy mixture. 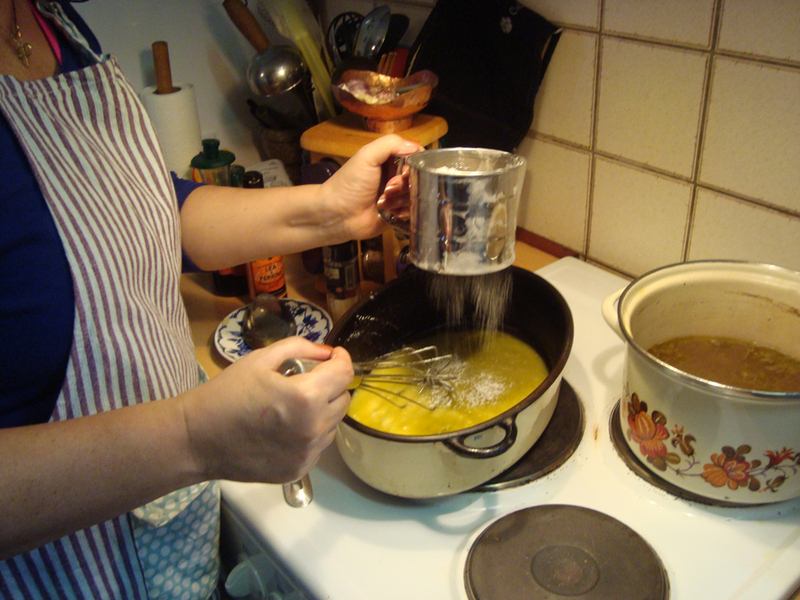 Let pie filling cook at medium to low heat stir occasionally while preparing pie crust. 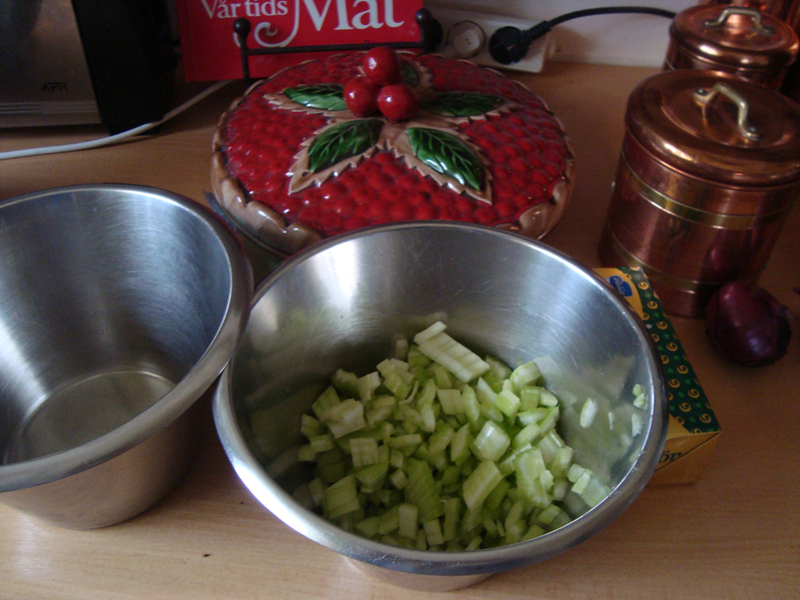 I roll the bottom crusts out for all the pies and fill with the vegetable mixture. 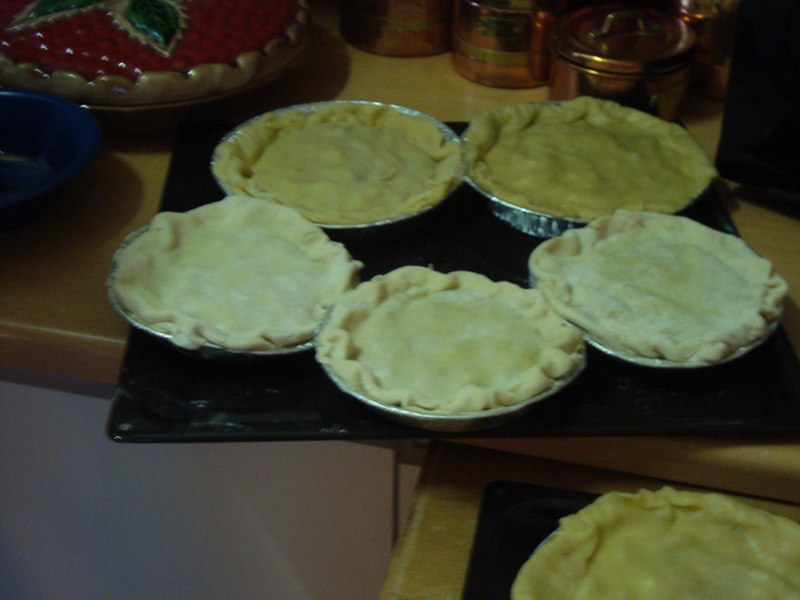 Then I roll the pie crust tops and place them over the filling. Roll edges under and use fork to seal. Cut slits in center to allow steam to escape. DO NOT BASTE WITH EGG IF YOU ARE GOING TO FREEZE THEM. 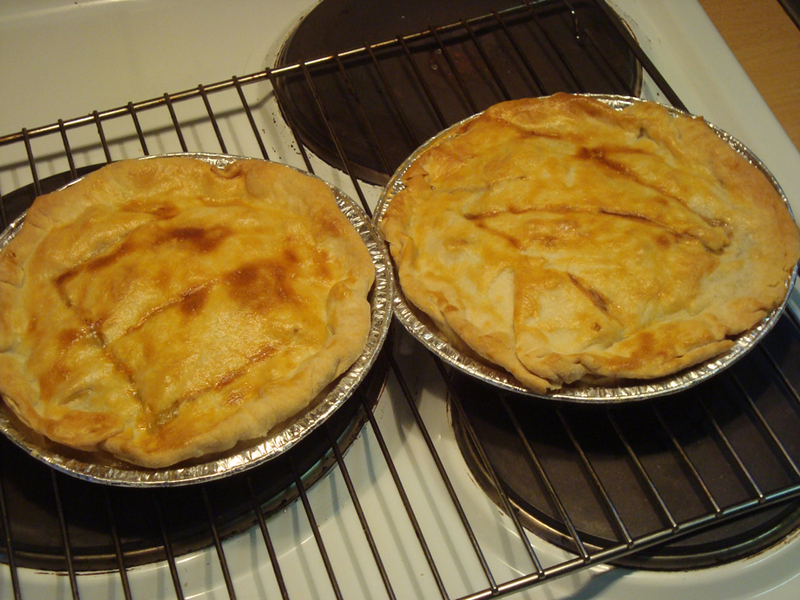 ONLY BASTE THEM BEFORE YOU COOK THE FROZEN OR FRESHLY MADE PIES.I lightly baste each pie with a whisked egg. Cook uncovered in 425 F oven until crust is brown 30 to 35 minutes. Makes around 8 servings. Another option is to freeze the pies (unbaked) on cookie sheets over night. Then the next day place them in ziplock freezer bags and label them. Cut shortening into flour and salt until particles are size of small peas. Sprinkle in water, 1 tablespoon at a time, tossing it with a fork or whisk until all flour is moisten and the pastry almost cleans the sides of bowl (added more water if necessary). I kneaded the pastry dough 5 to 10 times. Gather pastry into a ball shape and flattened round on lightly floured covered board or table top. For Two Crust pie, divide pastry into halves and shape into two round balls (For pot pies, I then divide the two balls in half and then each half into fourths. This gives you 8 top and 8 bottom for your pot-pies) Roll pastry 1-1½ inches larger than inverted pie plate on a floured surface with rolling-pin. Otherwise your pie crust will stick and tear.I roll out the crust then flip it and roll and flip it so that both sides of my crusts are floured. I flour my rolling-pin as well. Unlike for a fruit pie crust, I roll the pot-pie crusts much thinner. Once they are rolled out I fold the pastry into quarters, ease it into the pie pan and unfold the pastry while pressing firmly against bottom and sides. 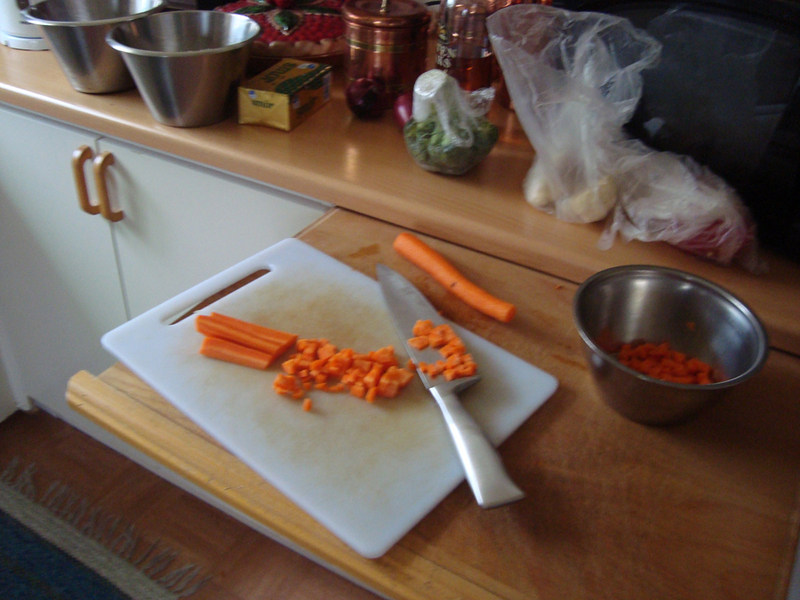 You can see from the pictures that I used a larger amount of vegetables than this recipe calls for. I no longer measure the amount of vegetables I use. I used this recipe just for the gravy. I doubled the gravy mixture in the pictures because I wanted to freeze some for later. I made 3 pie crusts and used two different size pie pans. I usually bake with the smaller pie pans but I bought the wrong size. The larger ones I call hungry man pot-pies. The recipe above is for the small pie pans.